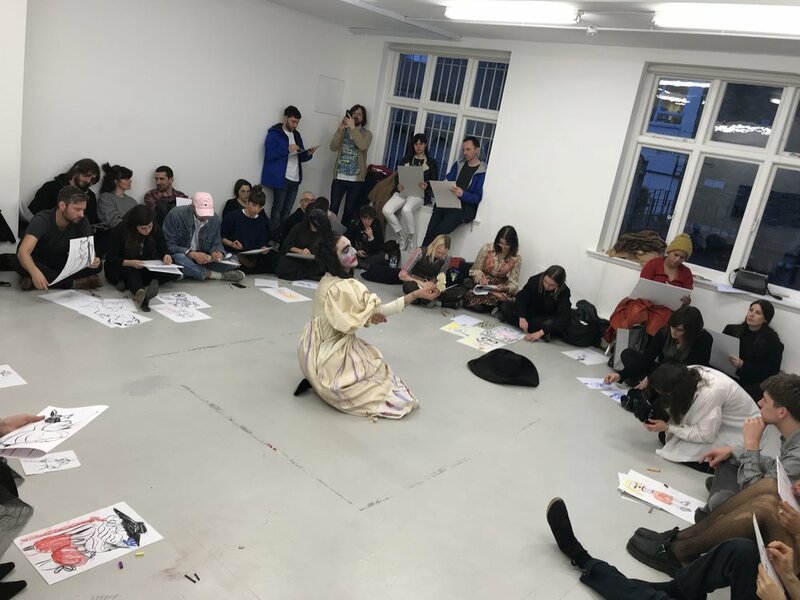 Emiliano Maggi's Life drawing class is part performance, part drawing session based on the figure of travesti in theatre and incorporating costume design, theatre staging and song. Emiliano Maggi, Choral Spectral, 2016. Join us for a new performance by Emiliano Maggi exploring the paradoxes and performativity of gender. Coming from a costume design background, the artist has made a series of costumes for his performance, Life drawing class, in which participants are invited to draw the artist-model in a succession of poses performing different gender identities. The performance is based on the figure of travesti in theatre, and references Shakespeare’s As You Like It in which the female character of Rosalind was traditionally played by a male actor, who then disguises herself as a male shepherd boy during most of the play. This presentation of gender identity as a costume works to destabilise binary identities and highlights the social construction of femininity and masculinity. All are welcome to join this free drawing class and paper and pencils will be provided. Emiliano Maggi (Italy) is an interdisciplinary artist based in Rome. He uses a diverse practice incorporating craft, sculpture, performance and song to explore themes of mythology and folklore. Recent exhibitions include Museo Civico Castelbuono, Palermo; Cinque Mostre 2017 at the American Academy in Rome; Galleria Lorcan O’Neill and Operativa Arte Contemporanea Gallery, both Rome.